The key Opera functions are available from the main menu. Note that nearly every element of the browser can be Ctrl-clicked to display a context menu offering further options. To view the main menu on Windows and Linux systems, click the big red “O” icon on the top-left corner of the browser. appears if you choose to display it and shows a list of open windows and tabs. To display the Window menu, select Settings > Preferences > Advanced > Browsing and select “Show window menu”. Context menus appear when you Ctrl-click various items and elements, either in the browser or on a webpage. They contain options relevant to the current element. The page menu appears when you Ctrl-click a part of a webpage where there are no links, images, or forms. The context menu for selected text contains a number of useful options. The image menu appears when you Ctrl-click an image and contains multiple options for opening, copying, and saving the image. Select “Image properties” to get all available metadata on the currently selected image. When you click an image that has a link, a menu will appear that combines items from both the image and link menus. When you click an image that links to an email address, a menu will appear that combines items from both the image and “mailto:” menus. The form menu appears when you Ctrl-click inside a form field. It holds a number of text editing options as well as the option to insert personal information from the Forms preferences and notes. Select “Check spelling” to perform a spelling check on all content in the current form field. Some of the most useful and frequently-used preferences are available in the “Quick preferences” menu. You can access this menu at any time by pressing F12 or selecting Quick preferences from the Opera menu. Tip: Open Opera’s preferences (press ⌘+, or Ctrl+12) for access to more settings. Opera’s panels, enabled by pressing F4 or by clicking on the panels icon on the left side of the status bar, give you quick access to your bookmarks, contacts, browsing history, and more. All your bookmarks can be accessed and managed in the Bookmarks panel. If you have a large selection of bookmarks, use the “Quick find” field to quickly retrieve what you are looking for. Select Bookmarks > Bookmark Page. Make sure that the “Create In” field shows the Bookmarks folder. Click “Show in panel”, then “OK”. In your panels, you’ll see a new icon for this page, which when selected, displays page content in the panel. Some webpages provide special links (rel=”sidebar”) that make it easy to add webpages as panels. Opera’s history panel keeps a list of webpages that you have recently visited. In Opera’s History preferences, you can choose how many addresses to keep track of. Tip: If you recall having visited an interesting site, but forgot to bookmark it, use the “Find” field in the History panel to locate it. Click history entries to open them in the current tab, or hold ⌘ (Shift on Windows and Linux) while clicking to open the entry in a new tab. This panel is only available if you have set up an email account. Create contacts and store email addresses, telephone numbers, and postal addresses. This panel is only available if you have email enabled. Edit selected contact’s name, email address, home page address, postal address, and phone numbers. Write down notes about the contact. Select a picture (about 60×50 pixels) that you would like to associate with the contact. Select a small icon you would like to have displayed next to messages from the contact. Tip: If you type the word “party” in the “Notes” field of your best friends, you can later type “party” in the “Quick find” field to find all those people, then drag and drop them into an email to send a party invitation. Opera’s download panel lets you monitor and control downloads to your computer. Note: Not all websites support resuming of downloads. The Notes panel can serve as a clipboard manager, a “to do” list, a template archive, and much more. The links panel extracts all links in the current webpage so you can easily find images, music, video clips, zip files and other downloads, as well as links to other pages. Example: Type “mp3” in the “Quick find” field to find all mp3 files on the page. Tip: Click the “Lock” button to keep the current list of links even if you browse to other pages. The Info panel displays technical information about the current webpage. The Search panel contains search possibilities for various search engines and online services. The Windows panel contains a tree-structured, clickable view of your open tabs and application windows. To customize your panel setup, go to Tools > Appearance > Panels, or Ctrl-click a panel and select “Customize”. From the list of available panels, select which ones to display and which ones to hide. Note that the “Mail” and “Contacts” options will be grayed out if the relevant account has not been set up. You can also select whether and where to display panels. Speed Dial is a set of visual bookmarks that is displayed every time you open a new tab, giving you quick access to your favorite websites and extensions. Each entry in Speed Dial is represented by a thumbnail, and clicking on the thumbnail opens a webpage. The first nine entries are accessible via the keyboard shortcuts ⌘ + [1-9] (for Windows and Linux use Ctrl+[1-9]. Add a webpage to your Speed Dial by clicking the star in the address field and choosing “Add to Speed Dial”. With Opera Link you can synchronize your Speed Dial on all your computers and all your devices. How do I add a new entry to Speed Dial? To save a web address as a Speed Dial entry, click on the [+] button. A dialog presents suggestions for addition to Speed Dial, including frequently visited pages, open pages, and Speed Dial extensions: you may select a webpage from the list or type in a new address. It is also possible to drag and drop from bookmarks, panels, or any other location where web addresses are displayed. To add an address, drop it onto the [+] button. How do I delete an entry from Speed Dial? To delete a Speed Dial entry, click on the cross on the lower right corner of the thumbnail. How do I reorganize Speed Dial? To rearrange, drag and drop the thumbnails; the dragged-and-dropped entry is inserted into the existing order, displacing the other thumbnails. How do I change the settings for Speed Dial? Click the “Configure” button in the upper right corner of the page. To change the background, check “Custom background image”, select the positioning of the background image from Best fit, Center, Stretch, or Tile, and locate the image you want to use. To change the number of columns, select the relevant drop-down value under “Number of columns”. To fix the zoom at a pre-determined value, change the drop-down value under “Zoom” to “Manual”, and adjust the zoom slider to taste. To hide the [+] Speed Dial button, check the checkbox. When the [+] button is hidden, the context menu for Speed Dial includes an additional item, “Add New Dial”. Multiple web documents and messaging views are accessible as tabs on the tab bar. You can organize your tabs in stacks. The Tab bar displays your open webpages as tabs and contains buttons to help manage your tabs. The “Closed Tabs” drop-down button on the right side of the tab bar contains lists of closed pages and blocked pop-ups so that you can easily retrieve them. The easiest way to change focus between tabs is clicking on the tab you want. You can also press Option + Tab or Ctrl + Tab to cycle through your open pages. Tabs can be rearranged on the tab bar by dragging and dropping them. You can reposition the tab bar using the tab context menu. Tip: If you want to bookmark a webpage, you can drag its tab directly to the Bookmarks panel. To drag it to an arbitrary toolbar, hold the Shift key while dragging. To recover a closed tab, click on the “Closed Tabs” icon on the right side of the tab bar, and select the tab. Note that you cannot recover closed private tabs. In analogy with stacks of paper on your desk, tab stacking helps you to organize your tabs, by collecting related tabs into a group. To create a stack, drag a tab so that it overlaps with any other tab, and drop it when the tab on bottom has a visible shadow. An arrow on the right side of a tab reveals the presence of a stack. Clicking on it expands or collapses the stack. Alternatively, hover the stack to show a set of clickable thumbnails. To unstack a set of tabs, or close the entire stack, right-click (or Ctrl-click) the tab stack, and choose one of the options under Tab Stack in the tab context menu. 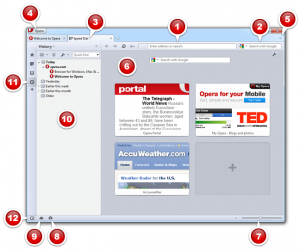 See the introductory video Tab stacking in Opera 11. To more easily identify your tabs, you can choose to display them as thumbnails. Drag the bottom of the tab bar down to expand tabs to larger thumbnails, or back up to minimize, or to any size in between. You can also middle-click or double-click the bottom of the bar to expand or collapse tabs. If you wish to browse without leaving a trace, for example, if you’re using someone else’s computer or a public one, you can use private tabs or windows. See more in the Private browsing topic. Right-click (or Ctrl-click) a tab to see its context menu. The preferences let you tweak Opera’s tab setup to your liking. By holding the Option key and repeatedly pressing Tab, you can cycle through all the tabs you have open within the active Opera window. This setting allows you to choose what order the tabs should be cycled in, and whether you want to see the list of open tabs while you are cycling through them. Check “Show thumbnails in tab cycle” to display a thumbnail of the selected tab in the tab cycle. When you open an item from the panels, such as a bookmark, the default action is to open the document in the current tab. If you prefer such items to be opened in a new tab, uncheck “Reuse current tab”. By default, new tabs are added at the end of the tab bar. Check “Open new tab next to active” if you want new tabs to appear next to the active tab on the tab bar. By default, a thumbnail of the page is shown when hovering a tab. To disable this behavior, uncheck “Show thumbnails when hovering tabs”. By default, a close button is displayed on each tab. Uncheck “Show close button on each tab” to remove the close buttons. By default, new tabs open within a single Opera application window. Select “Open windows instead of tabs” to make new tabs open in a separate window. 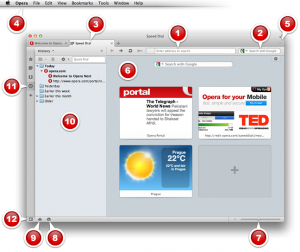 Opera’s most important functions can be found on toolbars in the form of buttons, input fields, and drop-down menus. The Address bar contains buttons for the most important browser functions as well as the web address (URL) field. Address field Displays the address of the current document. You can enter web addresses directly, or simply type a keyword you remember to activate the full text history search. You can resize this field by dragging the right edge. The web address is shown in a shortened version to help you identify websites. If you prefer to see the full web address for all sites, go to Opera/Settings > Preferences > Advanced > Browsing and check “Show full web address in address field”. Security indicator Displays the security status of the current document in the address field. Click on it for additional information. Search field Search the web directly. You can resize this field by dragging the left edge. Tip: If you have a web address on the clipboard, press ⌘ + Shift + V or Ctrl + Shift + V to “paste and go” to the address. When a page loads, a progress indicator appears within the address field. See the Tabs topic for more information. The status bar displays information about hovered items in webpages as well as in the browser. The Main bar is hidden by default. It mainly contains buttons for document handling, such as saving and printing files, as well as buttons that will tile or cascade all open documents on your workspace. Some sites provide special navigational links to make navigation within the site easier. Opera can display these links in the form of a navigation bar above the page contents. Which buttons are active (not grayed out) on the navigation bar, depends on the information provided by each page. This toolbar is not turned on by default. A particularly useful setting for this bar is “Show only when needed”, which will hide the navigation bar completely whenever it is empty. The Start bar is disabled by default. It drops down from the address field when the latter is focused. The View bar is disabled by default.